Please refer to our stock # SN85 when inquiring. 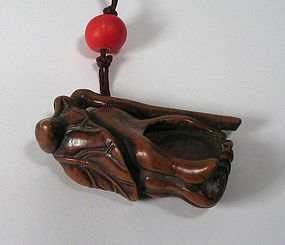 DESCRIPTION: An antique Chinese toggle (guajian), carved from boxwood in the form of a Buddha's hand fruit (or fingered citron), a symbol of happiness, longevity and good fortune in China. The fingered citron is unusually shaped with bright yellow fruit segmented into finger-like sections, resembling a human hand. Highly fragrant, it is used predominantly in China for perfuming rooms and personal items such as clothing. According to Buddhist tradition, the Buddha prefers the "fingers" of the fruit to be in a closed position where they resemble hands in prayer. This toggle has a luscious, old boxwood patina that only comes from age and handling. It's carver included multiple symbolisms in this little work of art: "closed fingers, open hand" (symbolizing prayer), capped with a sacred lotus leaf (eluding to Buddha's enlightenment vision), and topped with a lingzhi mushroom (symbolizing immortality). The toggle is strung with a cord through the openings in the stem, and is tied in place with a coral bead. It would have hung from a belt or sash, serving as a counterweight to a tobacco pouch or purse; a wonderful antique Chinese folk art piece, 18th C. DIMENSIONS: 2" long (5.1 cm) x 1.25" wide (3.2 cm).